Pacers adorn this weekend’s highlights, with older and younger fields in combat. For the mare pacers there are two generously pursed Golden Girl divisions at the Meadowlands and there are two New Jersey Sires Stakes (NJSS) finals for sophomore pacers on a huge Saturday program. More sophomores vie for big cash at Yonkers in the Art Rooney Final and Lismore (fillies) and colts fess up for lucrative Pennsylvania Sires Stakes (PASS) at the Meadows. In Canada, the Somebeachsomewhere stakes applaud speedy steeds in honor of the great sidestepper. The soph trotters continue on the long road to August. You can read our analysis of those races in this week’s Hambletonian Trail blog, brought to you exclusively by TwinSpires and the Hambletonian Society. More winners are projected in our exclusive harness horses to watch (H2W) list from tracks around North America. A trio of PASS for glamour-boy pacers are each over $79,000 at the Meadows on Friday, May 31. One of our successful choices, Martini Hanover, may be worth a shot with odds higher than the 2-1 he presented last week. The crowd will be all over Normandy Invasion, leaving “Martini” to hover as second choice or worse. Don’t count out Our Dragon King, who we shocked everyone with when he scored big at two. He is going to be a divisional highspire and though off to a slow start must be addressed, certainly at high odds. Next, trainer Ron Burke will likely offer the favorite with Dedi’s Dragon and that will open up a chance to get a good price on Some Kinda Beach. He is four for four this season and could make some major noise here. Then, we return to back Bigrisk, who was third for us last week. He may go off the favorite but probably not by many dimes, since Twillight Bonfire will get good support and the Dave Palone mount from post one will attract Palone fans. 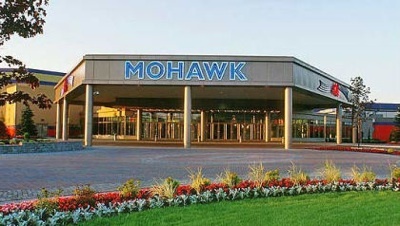 On Saturday, two NJSS finals, each worth $150,000, are on tap at the Meadowlands for the glamourous guys. A field of 10 go, with top names looking to cash in early on a big event. The top pair are Rockin Amadeus and Johny Rock, both beginning their soph seasons with fervor. There could be a price here, though, worth targeting, in Emeritus Maximus. It might be considered an upset but only due to the name recognition of the top pair. “Maximus” may be better at three and is going very well now for trainer Tony Alagna. We support him in this hoard of Rocknroll Hanover offspring. The fillies’ NJSS final is in the hands of I Luv The Nitelife, who will be the huge public choice and rightfully so. She seems to have entered her soph season with all the tools needed to dominate the division and an upset here is beyond our talents to predict. So a pass is our decision. The $150,000 Molson Pace Invitation at Western Fair Raceway will be contested as an invitational for the first time on May 31. The field will line up as follows: 1. Foiled Again, 2. Aracache Hanover, 3. State Treasurer, 4. Versado, 5. Rock On Moe, 6. Keystone Velocity, 7. A Rocknroll Dance and 8. Betterthancheddar. 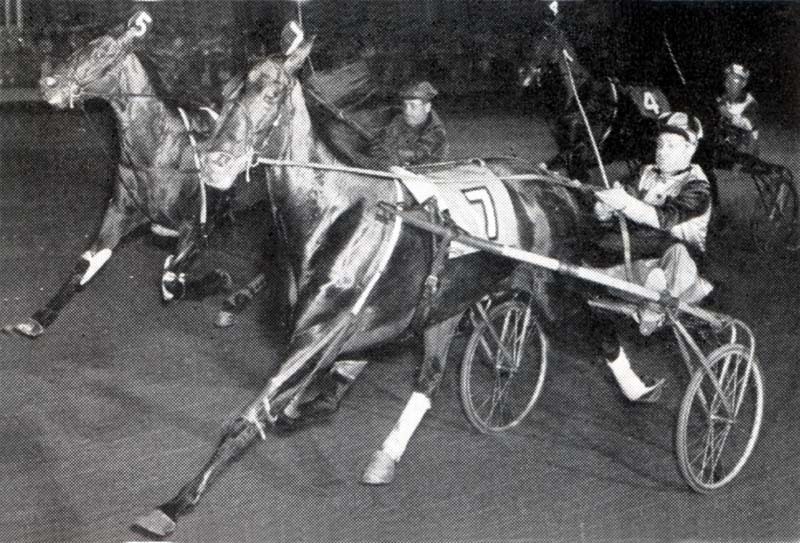 It will be his fifth trip to the event for Foiled Again, the sport’s richest pacer of all time. In 2011 he captured the final, worth $300,000 that year. Last year Foiled Again successfully defended his title. He won the final by a head over stable-mate Clear Vision in 1:51.3. But look out, the connections of Betterthancheddar accepted the invite to the final and the world-class pacer will be making his seasonal debut. He was a Breeders Crown champ and a surprise dominating factor in his division last season. His 8-hole start may only boost his odds, an element of his debut we embrace. More trouble may be in the works for the others as the connections of Something For Doc decided to bypass the Molson, leaving an invitation that was accepted by the connections of A Rocknroll Dance. He appears well healed from problems that set him back late last season and recently finished a strong fourth in the Dan Patch Invitational at Hoosier Park, which was a burnout’s paradise. He does, however, have more to be concerned about starting from post 7 than Betterthancheddar, who starts to his outside. For pure value, Betterthancheddar is our choice. Even with “Foiled” on the rail and the mystery of “Dance,” Casie Coleman may have her champion primed to debut in a big way. In fact, considering the prowess of this beast, you may not get a chance this season to see odds as large as we assume may present themselves here. Fourteen glamour-boy pacers drew into a pair of $75,000 divisions of the Somebeachsomewhere Stakes this Saturday, June 1, at Mohawk. This event is formerly the Burlington Stakes. This is the final stakes event leading up to the $1-million North America Cup. eliminations on June 8 ( the final will be on June 15). The first division features Vegas Vacation and Captive Audience, both top eligibles for the Cup. Vegas Vacation comes into the race off a pair of wins in conditioned company for trainer Casie Coleman. Captive Audience began his soph career with two seconds in conditioned races. Also here are Sweet Talkin Satin, Tarpon Hanover, Evenin Of Pleasure, Mach Pride and Urbanite Hanover. “Vegas” will be gunning but not offering much to win. We are interested in Mach Pride, one of the top-10 frosh-pacing earners last year. Giving him a shot in this could wind up to be a profitable move. The second division features Fool Me Once and Odds On Equuleus. Fool Me Once kicked off his soph season well for trainer Mark Austin , winning all three starts.. Odds On Equuleus opens his soph season here off three sharp qualifying wins for trainer Robin Schadt. Also here are Moonliteonthebeach, Varadero Hanover, Resistance Futile, Sunshine Beach and See And Ski. Varadero Hanover has won three of six this season and is gearing up for major stakes. He would be a nice catch here and needs to be respected. Absent from the divisions is Captaintreacherous, the top frosh-turned soph and early choice to win the Cup and other stakes for the glamour-boy divisions. His connections said that they’e skipping the Somebeachsomewhere due to travel considerations for the colt. Captaintreacherous’ trainer, Tony Alagna, is based in New Jersey and the connections don’t want the colt shipping just prior to the Cup elims. 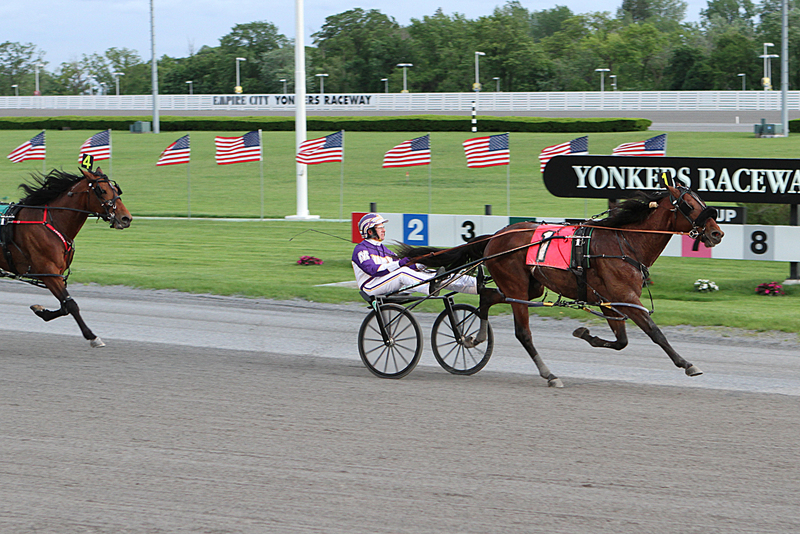 Mare pacers go after a lot of money, $90,000 plus in each division of the Golden Girls at the Meadowlands on June 1. Here they are again, the hard-working femme creatures of pacing, always at odds with one another, tightly matched and vehemently competitive. Round one offers six of them, with Anndrovette on the outside and Feeling You, already a winner of seven, on the wood. We should take heed of Bettor B Lucky because she is always ready to upset these types when a big purse is offered and do it at a price. Here she may be send off at a fair price of 3-1 or more, which is worth nabbing. In round two, our big score last week, Economy Terror, takes on her second of the season and is in a similar situation to get a winning trip, though we don’t expect her to go off anywhere near 10-1. This group appears lighter than the Betsy Ross cast, with speed that could come up short enough to appeal to a late-charging win. So we take her right back. 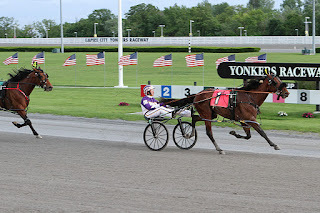 The 23rd edition of Yonkers Raceway’s Art Rooney final on June 1. This year, glamour-boy pacers go for a purse of $275,000. The field, in post-position order: 1-Sunfire Blue Chip, 2-Source of Pride, 3-Mach it So, 4-Good Day Mate, 5-Doctor Butch, 6-Sir Cary's Zam, 7- Lonewolf Currier and 8-Bet the Moon. Sunfire Blue Chip and Source of Pride race as a common-owner/trainer entry. We will go once again with Mach It So, who finished second for us in one of the elims last week. He could be the third choice if people go for the coupled entry and even though Lonewolf Currier has to negotiate the outside he will get a good piece of the win pool (if he doesn’t it will be because of the post and you had better respect him if the crowd lets him go off as third choice or worse). The companion stake is the $117,060 Lismore Pace for soph fillies. Although trainer Linda Toscano has four in the field, they are uncoupled due to bona fide separate ownership. But Freetime and Handsoffmycupcake are coupled due to common co-owner/trainer Scott DiDomenico. We will take JK Black Beauty, who should be a good price against the aforementioned foes. With a tight cover trip and no traffic late, “JK” could fly by the others, especially if they have been shuffling and battling during the four turns. Review our choices and follow the wagering at the prescribed track to decide how you will use the information. The list has shortened as the stakes season ensues but still offers the best possible contenders we have judged from reviewing races. The horses’ names are listed beneath the name of the track after the date they will be racing. The race in which they are entered (R and race number) follows. If a + is in front of a horse’s name it means that horse is appearing on the list for the second (and last time) because it failed to win the first time it appeared. An “ae” signals the horse is entered but on the also-eligible list (so it might not get into the race). Multi-horses may be listed in the same race. Horses from previous lists that are not racing this week will no longer appear until they are confirmed in a race. Wagering on any of the H2W listed horses is based on your own judgment. Your handicapping skills should include decisions to wager to win, place, show or in exotics. If you have any questions about the H2W list, send them to us through the TwinSpires blog channel.